Ning for Businesses is a social website platform which provides users with the tools to create and control their own social network. With a drag and drop network editor and design studio, users can build and customize their own website and add their own content. Ning for Businesses also features blogs, forums, customizable member profiles, events, and more. Ning for me was a great adventure in learning a new platform. I got my feet wet with online marketing with Ning as my first and still most loved content management system. I learned a great deal.I used Ning for three different attempts at building a social network that was self-sustaining over a period of several years. What attracted me to it was of course, having my own niche social network where like-minded individuals can come to support each other in their online or offline pursuits. The Ning community and web site is a niche social site in itself and that is a built-in peer support group right out of the box. I learned a lot of coding and site tweaking techniques and tips from these people that will benefit me for years to come. With my Ning sites, from a designer point of view, I was able to easily re-design, re-brand, update color schemes, and add new and interesting components with relative ease. One of the most enticing features, as a social network, is that when you go from the Ning site to your own Ning site to your friends Ning site, you keep the same friends from one to the other and add more as you join other sites. This is a feature I really enjoy. I believe that if Ning continues to upgrade and improve its service, it will continue to be a high contender in the niche social network platform community of service providers. I used Ning for three different attempts at building a social network that was self-sustaining over a period of several years. What attracted me to it was of course, having my own niche social network where like-minded individuals can come to support each other in their online or offline pursuits. The Ning community and web site is a niche social site in itself and that is a built-in peer support group right out of the box. I learned a lot of coding and site tweaking techniques and tips from these people that will benefit me for years to come. With my Ning sites, from a designer point of view, I was able to easily re-design, re-brand, update color schemes, and add new and interesting components with relative ease. One of the most enticing features, as a social network, is that when you go from the Ning site to your own Ning site to your friends Ning site, you keep the same friends from one to the other and add more as you join other sites. This is a feature I really enjoy. I believe that if Ning continues to upgrade and improve its service, it will continue to be a high contender in the niche social network platform community of service providers. In the beginning of my Ning journey which was approximately nine years ago, I noticed that there was a great deal of concern by Ning users about some of the developer features and the lack of a member payment feature. For instance, the Facebook sign in feature didn't work right for years. That was a development issue. I believe that most of the earlier development bugs were worked out through a series of upgrades to the platform and now they also have a paid member feature that can be added. The pricing has gotten too high, in my opinion. I believe that they need to offer a lower price for the new sites until they've built up their membership. The very fact that this is a niche network platform that takes time to obtain members to sustain the site makes their packages over priced for small businesses. It's a fine price for corporate companies, but very limiting for the new entrepreneur. Other than that, I don't have much to report on the downside of Ning. I look forward to creating and running my next Ning network with the knowledge I've gained from my decade long journey with this platform. Great platform for very small staffed community sites!We build a Ning site for our Non-Profit community. it grew to 3000 members within 2 year! Since I was the only webmaster, I needed a platform that saves me all the technical work and let me just administrate it, and Ning was the choice! We build a Ning site for our Non-Profit community. it grew to 3000 members within 2 year! Since I was the only webmaster, I needed a platform that saves me all the technical work and let me just administrate it, and Ning was the choice! Customer support was not as fast, but they did respond by next day. The rss feed modules would not update at times and I had to empty the cache for the site a few time. But no big deal. I suggested Ning software for building alumni community of my college. I saw their new design - it`s cool. It`s a good sign that the company is moving ahead. And I wouldn`t risk to change a tested since 2013 Ning to a new product. Especially now, when Ning adds new features. I saw their new design - it`s cool. It`s a good sign that the company is moving ahead. And I wouldn`t risk to change a tested since 2013 Ning to a new product. Especially now, when Ning adds new features. It has been quiet for a long long time. Previous management didn't put any efforts to contact with creators. Let's see what will happen after their big changes. Elena, thank you! We are aspiring for more and making big changes within to make your user experience better. You are welcomed to share your thoughts with our customer support. Very easy to use, great support working 24/7Design studio, extensive guides and support, forum feature. There are the top. Also I loved that in the future I can create events and send email broadcasts. Design studio, extensive guides and support, forum feature. There are the top. Also I loved that in the future I can create events and send email broadcasts. I needed close community for my customers where they can share their idea and discuss relevant topicsI`m pleasantly surprised with new updates. As I know, a new version will provide an opportunity to add and listen to music. I don`t know for sure, but looking forward to. I`m pleasantly surprised with new updates. As I know, a new version will provide an opportunity to add and listen to music. I don`t know for sure, but looking forward to. Monitor social performance with in-built analytics. Communicate to followers through blogs and forums. Create and customize a site using the simple drag and drop builder. Integrate with YouTube and Vimeo. Member sign-in via Facebook, Twitter, LinedIn and Google. Below are some frequently asked questions for Ning for Businesses. Q. What type of pricing plans does Ning for Businesses offer? Q. Who are the typical users of Ning for Businesses? Q. What languages does Ning for Businesses support? Q. Does Ning for Businesses support mobile devices? Q. Does Ning for Businesses offer an API? No, Ning for Businesses does not have an API available. Q. What other apps does Ning for Businesses integrate with? Q. 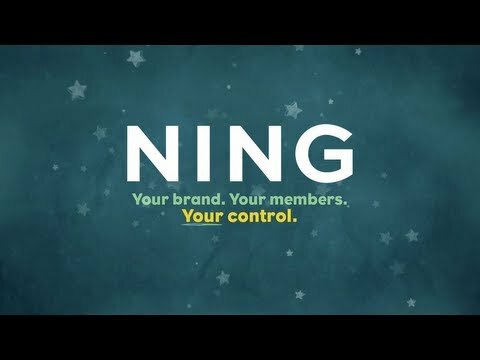 What level of support does Ning for Businesses offer?